Following up from our Blog posting in January, we thought our readers would like to learn a bit more about the school in Varanasi, India. Below are some photos and some information on what our donation will be aiding in abroad, in partnership with SOS Children's Villages Canada. Varanasi is located on the banks of the River Ganges in Uttar Pradesh, the Indian state with the largest population. It is regarded as a holy place for Hindus, Buddhists and Jains. In addition to being a cultural and religious center, it is also an important artisan producer of saris, carpets and other handicrafts. Children living in these conditions have a high incidence of sickness and malnutrition. Many risk losing parental care, as parents, who often struggle to scrape together a living, often find it difficult to meet the material and emotional needs of the children. Some of these children can be found on the streets during the day, trying to scrape together some money to contribute to the family income. For example many sell candles and flowers to tourists and pilgrims visiting the city. These children are very vulnerable as they struggle to keep safe, healthy and well-nourished. Gender inequality and the lack of education continue to be important issues in Varanasi. According to the most recent census, the average literacy rate in the district is 77 per cent but there is a significant difference between the male literacy rate - 85 per cent - and the female one - 68 per cent. Although among the poorest children of both sexes are often taken out of school so that they can contribute to the family income, it is still common for girls to leave school earlier than boys. 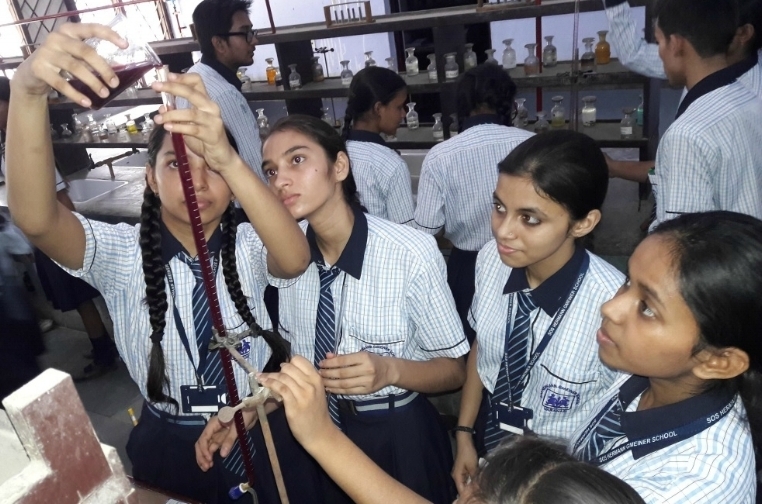 The SOS Herman Gmeiner School in Varanasi is located in a 9-acre lush green campus in the Chaubeypur area, about 9 km away from the well-known Buddhist Pilgrim center Sarnath. The school opened its doors in 1990 and has since been catering to the educational needs of the economically and socially deprived children of the nearby community, and the children living in the SOS Village Varanasi. A fleet of school buses, covering most of the city and its neighborhoods, operate on various routes to transport children to and from school. The school is now famous for its child centered teaching-learning activities and has a special focus on the intellectual, emotional, spiritual and physical development of the children. To create an environment for the realization of the physical and intellectual potential of the students. To include scientific temper, self-confidence and a spirit of adventure amongst the children. To develop a culture of equality amongst the children so that those who are coming from various sections of society, particularly those from the SOS Village, are fully integrated. To provide quality education in line with the National Education Policy. In 2016, the school is run by a team of 62 qualified staff and offers primary and secondary education to 1,563 children and youth. To keep principals and teachers ahead of the latest trends in education, the school conducts a number of leadership and capacity building workshops for the school staff. The children have access to a variety of facilities: The school library offers a wide collection of books. Apart from encyclopedias and reference books, the content-rich library has comics, story books and illustrated dictionaries. The SOS School Varanasi also has a state-of-the-art gym and health club where highly qualified gym instructor puts together the appropriate fitness plan for students tailored towards their specific needs. The school has a fully equipped Medical Room and the student’s health is monitored throughout the year. The students are periodically examined by ophthalmologists and dentists and records are shared with the parents. The school also has a cafeteria where nutritious refreshments, tea and a variety of snacks are available. These cater to all the food and nutritional requirements of the students and are well maintained to ensure high standards of hygiene. The students are also encouraged to participate in a variety of activities offered at the school. These include martial arts, yoga, Scouts and guides, arts, and a variety of sports like basketball, volley ball, football, and badminton.